High Performance Gaming PC manufactured by Multi Award Winning Palicomp – A combination of the latest Intel Skylake i5 processor and the AMD R7 250 2GB Graphics make this system a good good option for 1080p gaming at a budget. Can be supplied with Windows if needed. All systems will be stress tested for 24 hours after a test installation of Windows has been installed, our systems then go through a rigorous checking system to ensure the system is in perfect working order from Palicomp. We can combine the latest technology with to ensure that you get the best performance for value ratio. All systems are supplied with a 3 Year Warranty Labour, Parts covered for 1 Year, we have one the best support services in the industry. 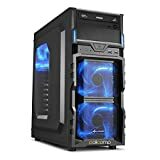 This entry was posted in Computer Desktops and tagged 1080p, 16Gb, 2133Mhz, 240GB, 3.2GHz, 3.6Ghz, 6500, Blue, Case, Core, Crucial, DDR4, Gaming, Intel, PALICOMP, Quad, Sata3, Sharkoon, Skylake, System, turbo/, VG5W by Express Computer Supplies. Bookmark the permalink.